The top two images are the only i could find, so if you have one feel free to send it my way. 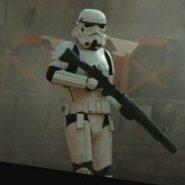 So the first thing i noticed (other than the black stock of course) was that the ribs start a little be further down the barrel as we are used to. After the second strip and not the first. I also noticed that other than the ribs it has no greebles. Its too blurry to see so i assume the flashlight is the standard one that we see on the E-11s. I think its interesting that the strap is attached to the top on what looks like both ends. The other image dosen't have a strap at all. With this image i noticed that the rear sight seems to have been taken off and filed down or changed to be more low profile. Also, i don't mean to get too critical but the main barrel seems to be thinner that some of our home made props. Did anyone see any in Solo? I don't remember seeing any but I've only seen it a few times.